Brody is a 5 year old boy with an infectious laugh and beautiful smile. He has no overarching diagnosis and a rare genetic condition. He also has epilepsy, autism and some mobility problems. 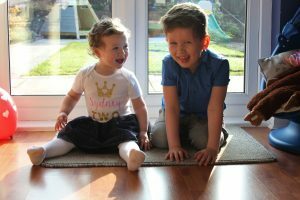 I write about our life on my blog, Brody, Me and GDD. Despite all of the difficulties Brody faces daily, he is very much a happy-go-lucky boy. Over the years, we have learned that we need to go with the flow and do what works for us as a family. There is no point in us going somewhere if he won’t enjoy it or if it’s inaccessible. It can be trickier now that his sister, Sydney, is getting older because she sometimes doesn’t understand this. But more than this, wherever we go, we are faced with a major problem that affects our entire family: A lack of accessible toilets. Brody is doubly incontinent and still wears nappies, but he no longer fits on a baby changing table. The fact is that it is hard to find anywhere that has an adult sized changing bench for us to change him on. Most places simply don’t consider Brody’s toileting needs and this limits where we can go as a family. As he gets bigger, we will find it harder to lift him, so we may require a hoist, as well as a changing bench. Because of this, we often have to change Brody in our car boot to avoid leaving him in a dirty nappy. This is degrading, humiliating and unacceptable. But we have no choice. This affects us hugely as a family, both mentally and physically. It’s hugely upsetting having nowhere to change our beautiful boy. Soon, even the car boot will no longer be an option for us as he becomes too big and heavy. I don’t want to change him on public toilet floors, but soon I may have no choice. Of course this also has an impact on his little sister. It affects where we can go and sometimes means that we have to leave early when she is having fun. How do we explain to her that we have to leave because venues have a toilet for everyone but her brother? It breaks my heart that there isn’t a legal requirement to provide accessible toilets. It feels as though society doesn’t care enough for my son’s health and dignity. We need to ensure that there are more facilities around to cater for the toileting needs of the thousands of disabled people like him, who are unable to use a standard disabled toilet. I’m sad that Brody and other disabled children and adults are thought so little of that this is a problem in 2017. I’m sad that our 2 year old daughter will grow up watching her brother treated this way and think that society believes that this is acceptable. It is not. I’m sad that so many are unaware that this is even a problem. And I’m appalled that so many politicians and big businesses who are aware of this issue, don’t do enough to prevent it. The saddest thing of all is that these toilets do already exist. 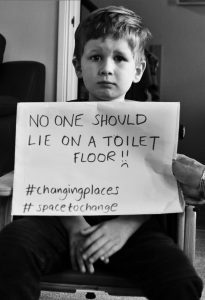 Changing Places toilets are safe and hygienic, have enough space, and the right equipment. But they are few and far between. Where we live, there is just one on a locked hospital ward. 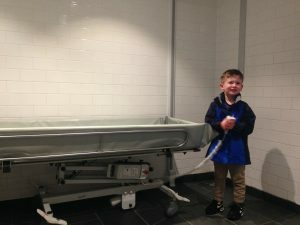 If Changing Places were mandatory in Building Regulations and British Standards, or at least in places like hospitals, airports and shopping centres, disabled people like my son wouldn’t have to face the indignities that too many currently face. This is the part of our life that people simply do not see. This is the Secret Life of Us. The Disabled Children’s Partnership (DCP) is a growing coalition of more than 60 charities who have joined forces, working closely in partnership with parents, to campaign for improved health and social care for disabled children, young people and their families. This website is managed by the Disabled Children’s Partnership, a consortium campaign of organisations administered by Royal Mencap Society (registered company in England and Wales no. 00550457; registered charity numbers are 222377 in England and Wales, and SC041079 in Scotland). Royal Mencap Society is registered as a data controller with the Information Commissioner’s Office under the Data Protection Act 1998 and our registration number is Z5709720.